Recognised as a top performing vacation rental as reviewed by travellers on the world’s largest travel site. 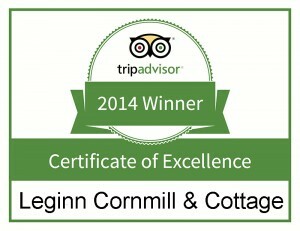 Leginn Cornmill & Cottage today announced that it has received a TripAdvisor® Certificate of Excellence award. The accolade, which honours hospitality excellence, is given only to establishments that consistently achieve outstanding traveller reviews on TripAdvisor, and is extended to qualifying businesses worldwide. Establishments awarded the Certificate of Excellence are located all over the world and represent the upper echelon of businesses listed on the website. This is the first year vacation rentals have been eligible for the award. “TripAdvisor is pleased to honour exceptional vacation rentals for consistent excellence,” said Dermot Halpin, President, TripAdvisor Vacation Rentals. “The Certificate of Excellence award gives top performing properties around the world the recognition for the consistently positive they receive from those who matter most – their customers. ← Billy the Goat !